Growing Green: WHAT? WOMEN ARE NOT YET EQUALS? LET'S GET ON WITH IT! WHAT? WOMEN ARE NOT YET EQUALS? LET'S GET ON WITH IT! Air Force Chief Master Sgt. Angela Valentine performs a poem honoring Sojourner Truth at Joint Base Elmendorf-Richardson’s Women’s Equality Day observance Aug. 26. Photo in the public domain via Wikimedia Commons. Women achieved the right to vote in the U.S. on August 26, 1920, with certification of 19th constitutional amendment as law. Other nations at other times, some earlier and others later. The far west states of Washington and Oregon were among the first to enact women’s suffrage (1910, 1912), preceded by a couple of other western states and territories. The western American states led in this matter and beat the rest of the country to the finish line. Yes, it's good to be a westerner all the time, but especially on August 26. Also great to have been ordained a clergyperson by Maynard Sparks, a bishop nurtured in the United Brethren Church tradition. The United Brethren were leaders in giving women leadership responsibilities in church affairs. In 1849, Charity Opheral was granted a preacher's license by the United Brethren Church. Shortly afterward, in 1851, Lydia Sexton was recommended as a "pulpit speaker" by the United Brethren General Conference. It's a good history of elevating women to church leadership early on, though ironically while maintaining the word "Brethren" emblazoned in the official name and on all church signs and literature. Skipping on to women in the family, let me raise a shout for my strong mother! She never made a speech for women's rights in the family; instead, she just grabbed the reigns with my dad and helped steer the wagon. She was a full partner with my dad in family financial management, whereas wives typically were taking lesser roles. At one point, their real estate investment partnership required a lawyer, and I recall my mother attending meetings of the partners as a full participant representing our family. I tagged along. Presumably she was showing me how to deal with legal matters. She, also, was a church leader: no voted office but long history of leadership in music and education within our congregation in Tacoma. 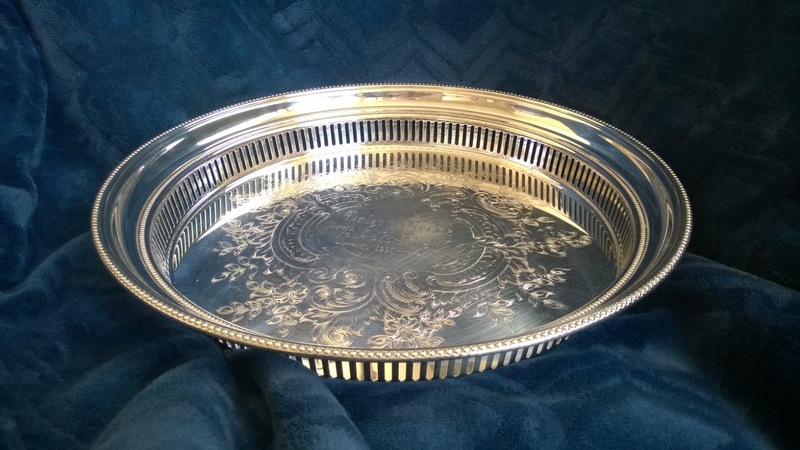 When she retired after many years as church organist, the congregation awarded her a wonderful memento: a tray. Inscribed: "Orleen Reeck: thank you for your dedication. 1991." What a great way to thank a friend! Mom treasured this until her death in 1999. Now it's in the hands of her grand-daughter. Among other women in my family, my mother’s mother was strong. I knew her husband, my grandfather, as the grandparent who occupied the rocker on the front porch of their house on West Grace Avenue in Spokane and took life easy. Probably Mom learned from her mother. My grandmother accumulated neighboring empty lots and then worked hard to transform them into her garden business. She ran a nursery-and-floral business out of her garage and continued on single handedly after my grandfather died. She, I might add, kept things green the natural way, without chemical sprays. In the 1960s and since, I've admired the activism of Betty Friedan and of many personal woman friends who fought for greater equality. They've made progress. In century 21 it’s a pleasure to see women sitting behind the big desk as chief executives of business organizations and as elected political leaders. It's incredibly painful to read of the vulgar woman-bashing that's going on in politics at this time. In that context, I’m grateful to President Obama for continuing the tradition of Women’s Equality Day by virtue of his proclamation in 2015. The president noted that there’s more work to do. Let’s get it done! I say, "Preach it brother!' And "preach it sister!"